Today, all types of companies, medical offices, law firms, etc. are finding it necessary to destroy their outdated confidential records. Tossing these records into the trash receptacle/dumpster may cause a breach of security for your company, your clients and your employees. Northeast Record Retention will pick up and shred all types of records including: paper, blue prints, CD’s, magnetic tapes and more. We encourage our customers to develop a destruction policy that all employees will follow and set up retention schedules so they are not keeping records any longer than needed. NERR will customize your needs whether we shred on-site or off-site. Our mobile truck comes to your location and the outdated confidential records are shredded in this vehicle. A TV screen monitor on the side of this truck allows you the customer to see your records being shred right then and there. Our securely locked trucks come to your location for a scheduled pick up. The driver loads your boxes of records on the truck and takes them back to our facility in Hooksett, N.H. where it is shredded and baled on our large plant based shredder. 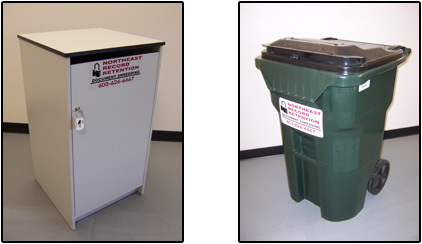 Same level of security and confidentiality as mobile shredding, but at a more affordable price. Our securely locked trucks come to your location for a scheduled pick up. The driver loads your hard drives on the truck and takes them back to our facility in Hooksett, N.H. where it is shredded. The Cutters are 9″ (229 mm) hooked Precision-ground from A-2 tool steel, heat-treated to optimum Rockwell hardness. The shred width is 1Â½” / 38 mm for maximum security. NERR has a vast supply of locked containers to maximize storage of outdated records waiting for destruction. We supply these containers at no cost to your company with a minimum pick up of once every four weeks.